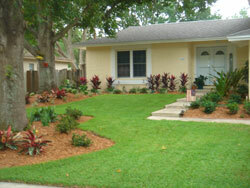 If you’re looking for a landscape company in the Tampa Bay area, you can depend on Evergreen Total Landscape. Customers in Tampa, Lakeland, Clearwater, St Petersburg, and beyond have relied on our expert services since 1983. From commercial landscape maintenance to pest control, irrigation repair to Christmas light decoration and more, we have a service to fulfill virtually every landscaping need. We also have a certified landscape designer on staff who can help make your dream vision become a reality. No matter where we perform our landscaping services, what always sets us apart from the competition is our proactive approach. We’re a landscape company that sends a project manager out to every job site to ensure everything is running smoothly and to be a resource for any questions our customers may have. We also perform weekly inspections on the properties we maintain in order to address any issues that may arise as quickly as possible. At Evergreen, the mission of our landscaping company is to relieve our customers of all the stresses that come with landscape management. If you would like more information about our landscape company, please call or e-mail us today. We happily serve customers in Tampa, St Petersburg, Lakeland, Clearwater, and surrounding cities.